Pakistan's prominent human rights advocate Asma Jahangir passed away in Lahore due to cardiac arrest at the age of 66 on Sunday. 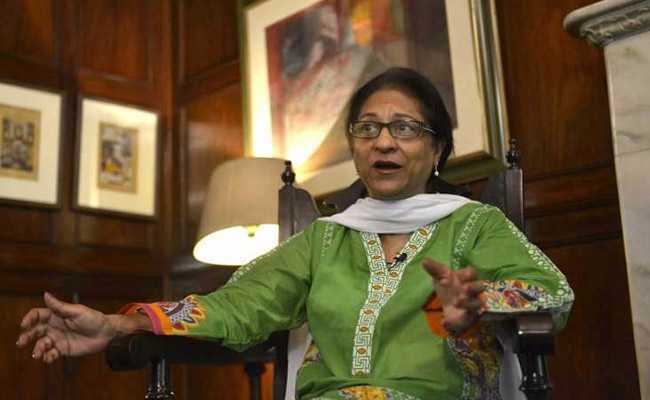 Pakistan's prominent human rights advocate Asma Jahangir passed away in Lahore due to cardiac arrest at the age of 66 on Sunday. Known to represent the voice of the marginalized community, Asma Jahangir was an outspoken critic of Pakistan's powerful military establishment. She braved death threats, beatings and imprisonment to win landmark human rights cases while standing up to dictators. Ms Jahangir also helped establish the Human Rights Commission of Pakistan. For her decades of rights work, she had received France's highest civilian award in 2014 and Sweden's alternative to the Nobel Prize. After the news of her death broke out, tributes started pouring on micro-blogging site Twitter - some emotional, some shocked, some deeply hurt. Here are some of the tributes for the champion of human rights, Asma Jahangir. Pakistan People's Party (PPP) Chairman Bilawal Bhutto Zardari changed his display picture on Twitter to Asma Jahangir and wrote a heartfelt message: "Devastated and heartbroken to hear of @Asma_Jahangir passing. Pakistan's champion of human rights and democracy. My personal inspiration and mentor who had so much more to teach me. Pakistan produces the bravest women the world has ever seen. Asma was one of them." Devastated and heartbroken to hear of @Asma_Jahangir passing. Pakistan's champion of human rights and democracy. My personal inspiration and mentor who had so much more to teach me. Pakistan produces the bravest women the world has ever seen. Asma was one of them. His sister, Bakhtawar Bhutto-Zardari, daughter of Pakistan's former Prime Minister Benazir Bhutto and former-president Asif Ali Zardari, wrote on Twitter, "Shocked to hear @Asma_Jahangir passed away. Huge loss for us, for #Pakistan. She was courageous, fearless, invincible. In absolute disbelief. Please pray for her & her family." Nobel Peace Prize laureate Malala Yousafzai wrote that she met Asma Jahhangir just a week ago. "Heartbroken that we lost Asma Jahangir - a saviour of democracy and human rights. I met her a week ago in Oxford. I cannot believe she is no more among us. The best tribute to her is to continue her fight for human rights and democracy," she posted with a picture with her. "Asma Jahangir was the bravest human being I ever knew. Without her the world is less," wrote prominent Pakistani lawyer Salman Akram Raja. Pakistan's famous writer and scholar Farahnaz Ispahani called her "Pakistan's brAve heart". She wrote, "My icon, Pakistan's brave heart & the best friend anyone could wish for. We are bereft today. Met her last in Lahore 3 weeks ago, discussed the continued fight for the 'disappeared', corruption of judiciary & keeping alive the fight for civilian primacy. #AsmaJahangir #Pakistan"
Pakistani actor Ali Zafar also took to Twitter to remember the human rights defennder. "Shocking to hear about the passing of this brave woman. Her honesty and sincerity to her cause remains an inspiration for our generation. Was always so full of life. We will miss you ma'am," Mr Zafar wrote, tagging Ms Asma in his tweet. Lyricist Javed Akhtar wrote, "Asma Jahangir , undoubtedly the bravest and the most resilient fighter for human rights who had the courage to face the wrath of the dictators and the fury of the fundamentalist Mulla has passed away . It is the loss of the whole Sub continent." Senior Congress leader Shashi Tharoor posted, "Saddened by the passing of @Asma_Jahangir. Though we had not been in touch for some years, I knew her during my @UN days &found her admirably courageous & principled, as well as a marvellously likeable human being. May her convictions & principles live on." Actor-Director Nandita Das shared, "Deeply shocked & saddened to hear of #AsmaJahangir. She was a true defender of #HumanRights #Democracy & fought till her last breath against authoritarian power, orthodoxy & discriminatn. She was & will remain an inspiration A huge loss. Condolences to all whose lives she touched." Tributes also poured in from actress Shabana Azmi, director Mahesh Bhatt, British historian and author William Dalrymple, among others.